I would like to share what SESB explained in detail in one of the local dailies which is not made available in its website www.sesb.com.my. Some slight changes made on the text to simplify the article, but leaving the clarity and meaning intact. 1. What triggered the incident? 2. 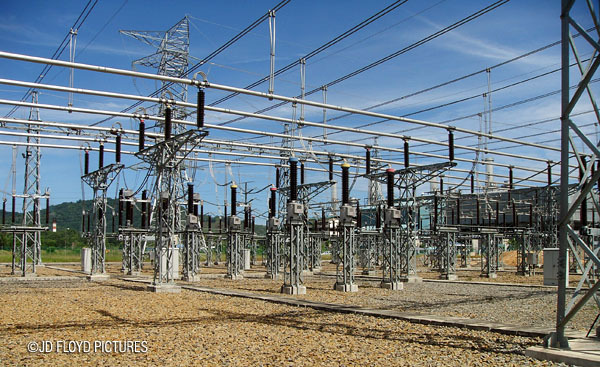 Why the 66kV Capacitive Voltage Transformer (CVT) failed? 3. Why it took a long time to restore supply in some areas? 4. The SAIDI figure integrity. The disruption to the supply system was initiated by a failure of a 66kV CVT at the Main Intake Station (PMU) Penampang at 3.23am. This had in turn caused cascading trippings to 2 of the anchor power stations in the West Coast totalling 290MW out of the 550MW load at the time of the incident. These had caused the relatively small capacity generating sets running in the East Coast at that time to experience overloading and their protection systems tripped them off also. With the tripping of the 2 anchor power stations in the West Coast which represent >50% of the demand at the time of incident and the subsequent protective trippings of the small power stations in the East Coast had caused the Grid frequency to plunge to a critical level that eventually brought down the whole Grid, i.e. blackout. This is a standard fail-safe mechanism designed for any Grid operation to prevent more widespread damage to the other components under similar circumstances. Why the 66kV CVT failed? Having studied and analysed the event log available at the SESB State Load Despatch Centre (SLDC) in Penampang by the engineers from TNB and SESB, it was found out that the particular CVT had experienced an intermittent and transient over-voltage. Unfortunately the intermittent and transient over-voltage which occurred in milliseconds was not readily detectable as it is not a standard power utility practice to install a real time monitoring facility for this type of equipment even for some bigger power utility entities. This had therefore been diagnosed to be as the reason for the CVT failure. All the results from the latest maintenance activity as above had shown no anomalies. SESB also highlighted that the size of this CVT is of no significant relevance in the way it affects the Grid System operation because the manner in which an equipment failure affects the Grid System operation also depends on many other factors such as generation capacity, power transfer from one point to another within the Grid, generation balance within the Grid, the fault level it triggered and the generator assigned as the system frequency control at the time of incident besides not forgetting the exercise of a prudent economic despatch regime. SESB said that it is definitely not an apple to apple comparison to say that the CVT to the Grid System operation is the same as a compass to a ship. It is more like a choked fuel filter on an engine of the ship which will cause the engine to stall and leaving the ship immobilised and stranded in the open seas until the engine is operational again. Why it took a long time to restore supply in some areas? As part of SESB's standard operating procedure, SOP, under such a situation, an established Emergency Response Plan (ERP) was immediately activated with the Managing Director or the Senior General manager (asset Management) being the Commander and the General Manager (System Operation) will act as the overall coordinator for the Grid System restoration. Under such conditions the Grid Operation will be split into 6 independent islanding operations to facilitate safe, orderly and speedy restorations. The 6 'islands' are Patau, Pangi, Salut, Melawa, Sandakan and Tawau. This was what had been activated during the incident on the 30th April 2012. The extent in which supply restoration can be achieved in these separate independent islands depends primarily on the generation capacity compared to the load demands within the island. If the generation capacity far exceeds the load demands then a safe, full and speedy restoration could be achieved. Conversely, the island in which the generation capacity is lower than the load demands, at best only partial restoration could be achieved in a safe manner. Full supply restoration could only be achieved once all the independent islands are safely connected to the Grid again with all identified generator achieved full and stable operations. During the incident on 30th April, the first partial area restored was in Tawau at 4.20am, while the last 11kV feeder restored was in Balung, Tawau at 7.47pm. The main reason for the long delay to achieve full Grid operation was due to some of the generators had unfortunately not been able to achieve full, safe and stable operation faster. For this, a further analysis had been commissioned by both TNB and SESB engineers to ascertain the root cause which will also cover all aspect of generator start-up requirement such as, among others, auxiliary relay settings, gas supply conditions and gas to distillate change-over facilities on the relevant power stations, both which belongs to SESB and the IPPs. Find out how to calculate SAIDI in my previous article. SESB is required by Energy Commission Malaysia (EC), through regulatory compliance of one of the License Conditions, to submit reports on supply status on a daily basis. The actual official figure for SAIDI announced by SESB from time to time is that which had been endorsed by Energy Commission. Only EC can certify certain SAIDI figure to be officially taken as true number. It should be noted that SAIDI is just one of the internationally accepted measure for electricity supply performance. Electricity supply performance is also the result of the existence of adequate basic infrastructure such as logistically balanced anchor generation sources and capacity, strong complete-loop transmission network as well as distribution infrastructure. Hence, highlighting the persistent efforts by SESB to implement projects in the East Coast to help create generating balance in the Grid System.